1. Pass actual before expected value to get proper failure messages. 2. Most failures are self-explanatory and should not have a message string. 3. Let the macros do the comparisons so they can report the failure values. 4. Watch for object comparisons done accidentally as pointer comparisons. 5. 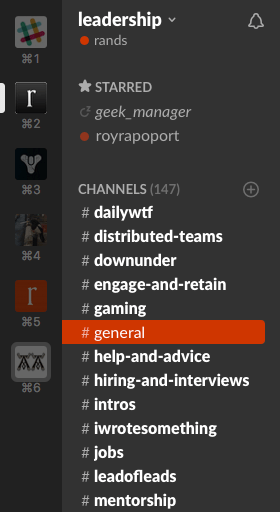 Each Slack team I’m on has a different set of humans building their own unique communication culture. I’m actively on six teams: SlackHQ, Leadership, Destiny, two private nerd Slacks, and a private family Slack.